In the present prospective longitudinal study 17 male endurance trained athletes (cyclists and triathletes; age 23.4 ± 6.7 years, VO2max 61.2 ± 7.5 ml · min-1 · kg-1; means ± SD) were investigated both during a state of overtraining syndrome (OT: N = 15), mainly induced by an increase of exercise intensity, as well as several times in a state of regular physical ability (NS: N = 62). 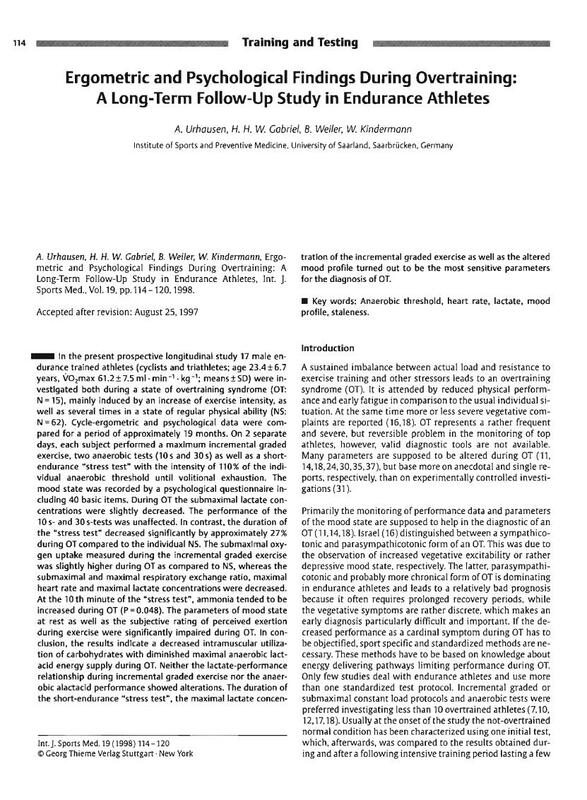 Cycle-ergometric and psychological data were compared for a period of approximately 19 months. On 2 separate days, each subject performed a maximum incremental graded exercise, two anaerobic tests (10 s and 30 s) as well as a short-endurance „stress test„ with the intensity of 110 % of the individual anaerobic threshold until volitional exhaustion. The mood state was recorded by a psychological questionnaire including 40 basic items. During OT the submaximal lactate concentrations were slightly decreased. The performance of the 10 s- and 30s-tests was unaffected. In contrast, the duration of the „stress test” decreased significantly by approximately 27 % during OT compared to the individual NS. The submaximal oxygen uptake measured during the incremental graded exercise was slightly higher during OT as compared to NS, whereas the submaximal and maximal respiratory exchange ratio, maximal heart rate and maximal lactate concentrations were decreased. At the 10 th minute of the „stress test”, ammonia tended to be increased during OT (P = 0.048). The parameters of mood state at rest as well as the subjective rating of perceived exertion during exercise were significantly impaired during OT. In conclusion, the results indicate a decreased intramuscular utilization of carbohydrates with diminished maximal anaerobic lact-acid energy supply during OT. Neither the lactate-erformance relationship during incremental graded exercise nor the anaerobic alactacid performance showed alterations. The duration of the short-endurance „stress test”, the maximal lactate concentration of the incremental graded exercise as well as the altered mood profile turned out to be the most sensitive parameters for the diagnosis of OT.